When I am stressed, my natural tendency is to turn to my addiction for comfort. If I am aware that I am stressed – or likely to become stressed – I can prepare myself so that I will be less likely to give in to temptation. But sometimes I don’t recognize the indicators that I am becoming stressed or the signs along the path warning me that I am likely to get stressed. In Overeaters Anonymous and other 12 Step fellowships there is an acronym that can help keep in the forefront of my mind some of the types of situations that are likely to make me vulnerable to my addiction. 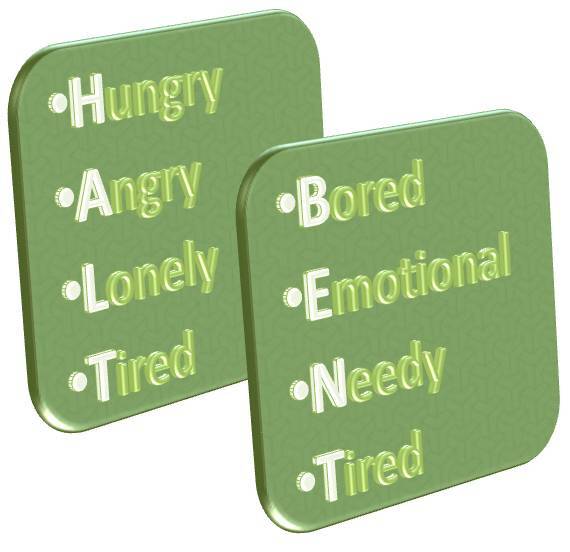 The acronym is HALT, which stands for Hungry, Angry, Lonely, Tired. If I become too hungry, angry, lonely or tired I will be more likely to act out – to indulge in my addictive behaviors. Why would being hungry (or angry or lonely or tired) make me, as a compulsive eater, want to eat uncontrollably, or make any addict want to indulge in their addiction? I don’t know, but it does. Don’t believe it? Observe your own behavior. How do you behave when you find yourself in one of these states? Years ago I observed that there is another mental state that can cause the same vulnerability: boredom. This sent me on a quest for a new acronym, one that would cover the HALT items, but also include a letter B. 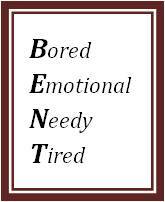 This is what I came up with: BENT, which stands for Bored, Emotional, Needy, Tired. When I am bored, emotional, needy or tired, I have a tendency to become vulnerable to my addictive behavior. 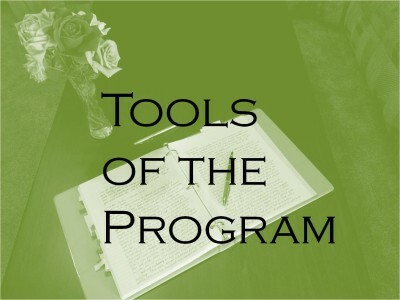 So, I try not to let myself become BENT, and if I recognize that I am, I take steps to protect myself from that vulnerability by using one or more of the tools of the program. (See my posts on TOOLS). Do you become vulnerable when you are HALT or BENT? What can you do to protect yourself from becoming HALT or BENT? What can you do to keep from acting out if you find yourself HALT or BENT?